With the expectations for the long Labor Day weekend, few companies announced any dividend hikes. The major dividend increase came from Verizon Communications Inc. (VZ) which offers Wireline and Domestic Wireless communication service in the US. The company’s board of directors announced a 3.3% increase in its quarterly dividends to 47.5 cents/share. This is the third consecutive year that Verizon's Board of Directors has approved a quarterly dividend increase in September. Verizon chairman and CEO said: "This increase reflects the strength of our cash flow and balance sheet. It demonstrates the Board's commitment to return cash to our shareholders while continuing to invest in the long-term growth of our business." The company currently yields a very respectable 6.10%. Before you decide that Verizon (VZ) is a great company to own however, please consider the following information. First, the company has been unable to increase earnings per share over the past decade. 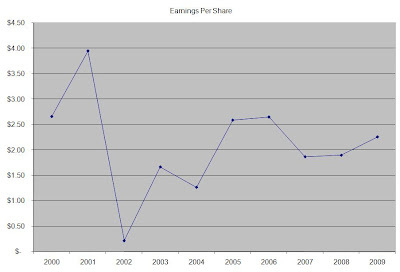 EPS has declined from $2.66 in 1999 to $2.26 in 2008. Smart dividend growth investors understand that without growth in earnings, the company’s ability to generate dividend growth is very slim. Second, the company does not have a long history of consecutive dividend increases. The company started raising its distributions in 2005, after 6 years of unchanged dividend payments. The positive factor however is that the company has not cut its dividends over the past 25 years. It has either raised them or kept them unchanged. 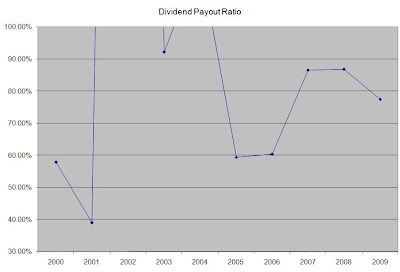 Third, the dividend payout ratio is not covered well enough to support further dividend increases. Currently this indicator is at 77%. This, coupled with the fact that EPS growth has been stagnant over the past decade not only means that future dividend growth would be close to zero, but that the dividend payment could end up in jeopardy of a dividend cut. The positive factor here is that in 2008 cash flow was $7.57 per share. The capital expenditures required to maintain the business run at about $6/share. This leaves all remaining cash flow for dividends. The company’s growth could come from focusing on its wireless operations, realizing synergies from acquisitions of Alltel and cost efficiencies. I view as a positive the fact that Verizon (VZ) is selling almost 5 million fixed lines and 1 million broadband customer accounts to Frontier for $8.6 billion. Wireline is in a decline, and thus focusing most of the attention to wireless operations is a smart move for the long run. At this point of time I am not a big fan of telecom companies such as Verizon (VZ) and AT&T (T), which both spot above average dividend yields. Their dividend payouts are above 74%, which seems unsustainable to me. Earnings growth also appears to have stalled, which is not a good sign for long term dividend growth. On the other hand I like the fact that both companies have been gaining share of the wireless markets either through acquisitions or organic growth. The telecom market is highly competitive; the costs to maintain and operate a network run in the tens of billions of dollars for companies the size of AT&T (T) and Verizon (VZ). At this point of time I would maintain a hold on both AT&T (T) and Verizon (VZ). While the current yield is very tempting, without a boost to dividends in the future, inflation would erode their purchasing power over time.